The simple life in America means we live with less—right? But living with less here means something different than living with less elsewhere. For example, the two young boys in this picture wanted nothing more than to shake my hand and walk around the compound with me. They practiced their broken English, and held on to me, filled with laughter and energy. They couldn’t stop smiling. 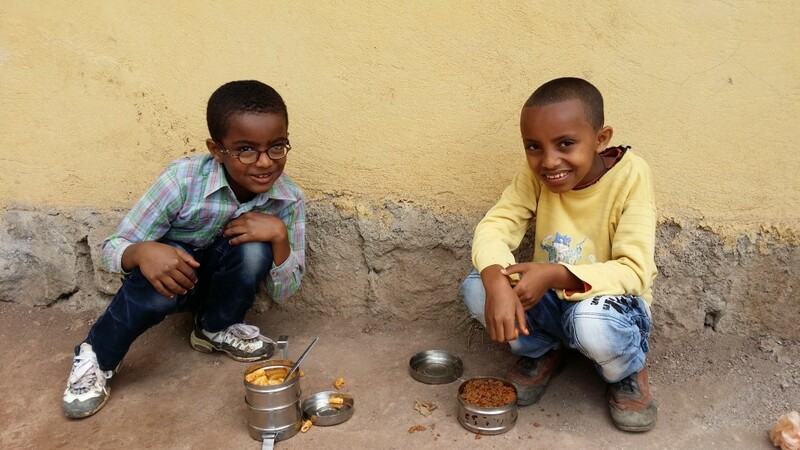 They couldn’t stop smiling even though the food you see in the photo is all they would eat that day—and they were thankful for it. They couldn’t stop smiling even though their homes were single, tiny rooms surrounded by other single tiny rooms, one for each family. The food in their little pots didn’t get filled every day, just five days a week, but that was five days they could eat. I’m not trying to break your heart. I’m trying to show you two young boys who are excited about life because, in the midst of extreme poverty, they know Jesus. And they know Jesus because someone told them. Someone stepped out of their comfort zone and took the Gospel to where it had never been. We call it the Great Commission and shroud it in the cloak of sacrifice, as if we are giving up everything to be obedient to it. They call it food, and clothing, and eternal life. For people who have nothing to call their own—nothing at all, they call it love. These little guys were typical of the children we saw that day. They were thankful for the food and clothing, shelter and schooling. But more than anything, they were thankful that we came and held their hands. They couldn’t believe that we would come just to visit. What a humbling experience to have a poor child end your visit with them by offering you some of their food in the midst of their hunger. Pray for them, and then go.